In a bid to harness solar energy, Indian Railways is all set to conduct trials of its first solar panel-powered train in northwestern Jodhpur city. Though the train would be pulled by conventional diesel-run engines, the solar energy will be used for internal electricity gadgets. 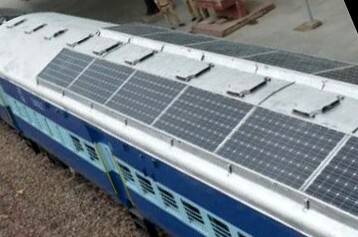 Solar panels have been installed on top of the coaches in the train and the energy, which will provide the energy to be used for the functioning of lights and fans inside the coaches in the train. The Indian Railways has been focusing on alternate source of fuels with trials already on to use CNG, biodiesel and natural gas among others. According to studies, a train using solar power can reduce diesel consumption by up to 90,000 litres per year and also bring down carbon dioxide emissions by over 200 tonnes. The CNG is being used in local trains on Rohtak-Rewari section of Delhi division. The dual fuel concept of using CNG and diesel has also helped in saving fuel and money.